With the help of Figure 17.8, we can recap (no pun intended) our discussion of capital structure and cost of capital. As we have noted, there are essentially three cases. We will use the simplest of the three cases as a starting point and then build up to the static theory of capital structure. Along the way, we will pay particular attention to the connection between capital structure, firm value, and cost of capital. 590 PART SIX Cost of Capital and Long-Term Financial Policy by its debt policy, so VL is simply constant. 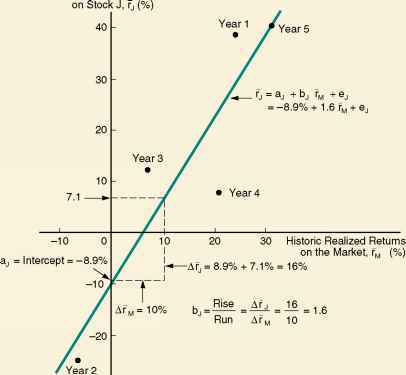 The bottom part of Figure 17.8 tells the same story in terms of the cost of capital. Here, the weighted average cost of capital, WACC, is plotted against the debt-to-equity ratio, D/E. As with total firm value, the overall cost of capital is not affected by debt policy in this basic case, so the WACC is constant. Next, we consider what happens to the original M&M argument once taxes are introduced. As Case II illustrates, we now see that the firm's value critically depends on its debt policy. The more the firm borrows, the more it is worth. From our earlier discussion, we know this happens because interest payments are tax deductible, and the gain in firm value is just equal to the present value of the interest tax shield. In the bottom part of Figure 17.8, notice how the WACC declines as the firm uses more and more debt financing. As the firm increases its financial leverage, the cost of equity does increase, but this increase is more than offset by the tax break associated with debt financing. As a result, the firm's overall cost of capital declines. To finish our story, we include the impact of bankruptcy or financial distress costs to get Case III. As shown in the top part of Figure 17.8, the value of the firm will not be as large as we previously indicated. 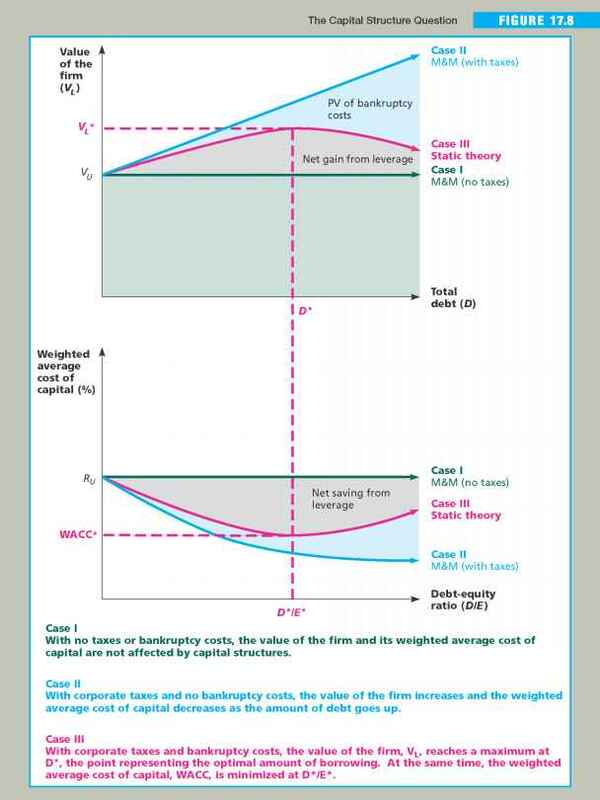 The reason is that the firm's value is reduced by the present value of the potential future bankruptcy costs. These costs grow as the firm borrows more and more, and they eventually overwhelm the tax advantage of debt financing. The optimal capital structure occurs at D*, the point at which the tax saving from an additional dollar in debt financing is exactly balanced by the increased bankruptcy costs associated with the additional borrowing. This is the essence of the static theory of capital structure. The bottom part of Figure 17.8 presents the optimal capital structure in terms of the cost of capital. Corresponding to D*, the optimal debt level, is the optimal debt-to-equity ratio, D*/E*. At this level of debt financing, the lowest possible weighted average cost of capital, WACC*, occurs.